The best part of winter in San Diego is the quiet beaches. I love them! Sadly, I usually live in the real world where some days are not long enough to take the dogs to the beach, give them a bath and quickly dry them before they start rubbing on the furniture. On those days, I do the next best thing and bring the beach home. I am sure I can think of some way to incorporate lots of sandy tennis balls, half eaten sea shells and once beautiful beach towels into my decor. But I think that Anne at BeanTown Handmade has a better idea. 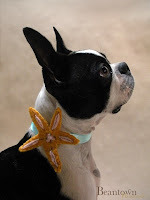 She has designed Beach themed collar art sleeves (shell, starfish, fish) as modeled by their famous dog, Bean (below) and found in her Etsy store, BeanTown Handmade. Anne at BeanTown Handmade is graciously offering a GIVEAWAY. 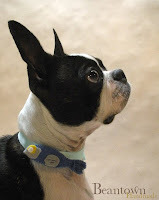 The winner can choose any design from the collar art listed on the BeanTown Handmade site and she will customize it to your dog's collar size. I recently ordered the Star Fish collar art for a 1" dog collar for our Black Lab Layla to wear on Therapy Dog and Dogmom days at the hospital. 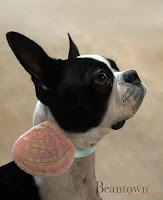 Post a comment on this blog post telling us if your favorite item on the BeanTown Handmade, which collar art you like and the width of your dog's collar (1 entry). It is very important that you include your email address so we can contact the winner. If you do not have a Google account, select anonymous. This contest has ended. The Sweet Dog Winner is Angie. Thanks to all of you who participated in the giveaway and support this blog. I really appreciate it! Check back for more great product reviews and giveaways. 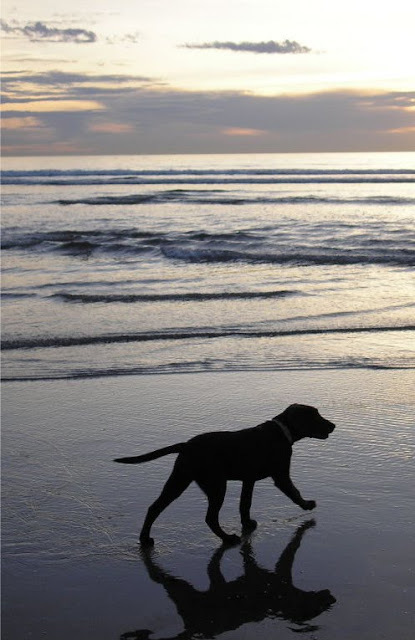 Here is a little bit of "early" summer for you to enjoy with your Sweet Dog .